A key part of St. Ambrose University's present and future is affordability. During the course of the Building Our Future campaign, 41 donors chose to support the university by establishing an endowed scholarship. This allowed them to honor a loved one and provide a St. Ambrose education to a deserving student. Tom '61 and Judy '60 Sunderbruch exemplified the St. Ambrose University mission through their lives' work, as an educator and nurse respectively. Their vocations allowed them to give back and help others. Judy was a registered nurse, with a special love for children, spending the majority of her career in pediatrics. She also stayed close with her nursing classmates, the "Mercy Nurses." After Judy's passing in 2014, Tom and his family decided to establish an endowed nursing scholarship to honor Judy's 40-year nursing career and dedication to the nursing profession. The Judith L. Sunderbruch Nursing Scholarship will keep the education that supported Judy accessible to many future nurses at St. Ambrose. According to Tom, there are a myriad number of reasons that prompted him to create the scholarship, but the best reason is that he credits St. Ambrose with introducing him to Judy. Albert Naal '57 developed an early love for St. Ambrose University with life-long friendships and learned business principles used to run a successful plumbing and heating family business. The Catholic values and traditions that shape St. Ambrose University also shaped and guided his life. Al met his wife Fran in 1959. During their time together, Fran often heard about Al's appreciation for St. Ambrose. Al passed away in 2006, but his love for St. Ambrose left an impression on Fran and she established the Albert C. Naal '57 Endowed Scholarship for a business major. "I started the scholarship because of Al's love for St. Ambrose," she explained. "It's a way to perpetuate his love for the university, and as a grandmother of five grandchildren, I know how expensive it is for today's students to attend college. This scholarship offers a way for me to give back." SAU Trustee Paul Sachs and his family established a scholarship for nursing students in 2012 to honor his mother who was a nurse and educator throughout her life. Lorraine Behnisch received her BSN from Marquette University School of Nursing. After pausing her career to raise seven children, she returned to her passion to teach Nursing at Black Hawk College and Marycrest College in the 1970s. After a move to Rockford, she worked as a nurse at Crusader Clinic, which provided healthcare to the needy, and River Bluff Nursing Home. Upon retirement, she continued to volunteer at River Bluff. "Nursing was her passion," said Paul. "She read and researched throughout her life about healthcare. 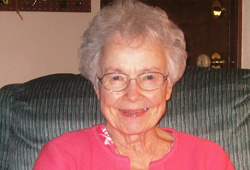 She loved encouraging others to pursue the nursing profession and help those in need. A scholarship to help students pursue their interests in the nursing profession seemed like the perfect way to continue our Mother's passion and provide a legacy in her honor for generations to come." When our students receive financial support from a named scholarship, they send letters of gratitude to the donors who establish the fund. These mean a great deal to the Sachs family, said Paul, as "those letters usually describe their future interests in the nursing profession and are very heartwarming to our family in knowing that this is what Lorraine would have smiled about." Endowed scholarships allow others to pay tribute to loved ones, and their passions. They also illustrate the tradition of philanthropy at St. Ambrose for our students. These families wanted to recognize their loved ones and the lives they led by providing our students with the gift of a St. Ambrose education: an important part of Building Our Future.